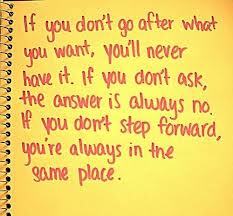 There are so many reasons not to go for it. You can have a really nice life setting your goals a bit lower (the MacEnroe brothers made this point earlier this week, talking about longtime top-10 player Thomas Berdych: “He’s got a steady ranking, he’s making a ton of money. Why would he want to mess with his game to see if he could get into the top 3 or 4?” they asked.) People like you better when your goals are manageable and make sense to them. I’m not sure what it is, but we get really nasty to each other when one of us dares to express a huge goal that is unlikely, but still possible. And let’s be honest–it’s rare to see someone who is highly accomplished AND well liked. Kim Clijsters comes to mind, and she’s incredibly rare. Listening to this last night forced me to admit how many of my goals I’ve let slide because they bothered other people, people I wanted to like me. My bad. Because looking back on this, I see that the people who aren’t going to like you because your goals seem outrageous to them aren’t going to like you even if you throw out your goals. There’s still this quality about you that wants to go for it (whatever IT is) and that will forever infuriate people who are infuriated by that. I don’t know that there’s any generalizable quality to these people–my friend Kate used to call them “Dream Squishers.” But they crop up whenever you’re accumulating the necessary ingredients (courage, faith, patience, endurance, strength, etc.) to really go for something big. Here are the other things I remembered as I thought about this last night: It felt like NO ONE believed God would send me a husband when I started praying for one. And once Steve and I were married, VERY FEW people (I can count them on one hand) believed we could build a happy marriage, or that a happy marriage was even possible, for anyone, ever. No one but Steve believed I’d get an agent, or a book deal. And even after my second book I was told point-blank that wanting to speak to people to encourage them toward hope and faith in God was a ridiculous career plan and that I was obnoxiously self-promoting. I was told to GET DOWN. And so I did. As I said in my second book, my favorite part of my faith is that it allows for do-overs. I don’t know if Sloane Stephens or the the other American players will take Chris Evert’s words to heart, but I can. I can let them challenge me, convict me, prompt me to change direction. That’s what repentance is: saying, “Wow God, I blew it. Please forgive me. Show me a different way,” and then walking that new way. You can do this, too. No matter how old you are, what you’re doing with your life right now, or how many times you’ve shrunk back from something you really wanted to go after. 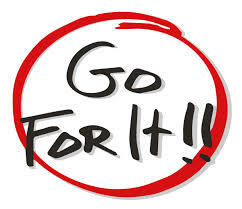 You can go after it now. It’s not THAT scary to give 100%. It’s far more soul crushing to shrink down into your best approximation of how others want you to be. Looking for more inspiration? Check out Claire Cook. She’s the bestselling author of a bunch of great novels, such as Must Love Dogs and The Wildwater Walking Club. She started her writing career in her mid-40s. 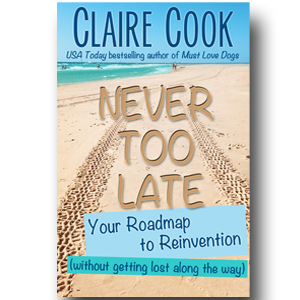 Now she’s reinventing herself as an independent (which means self-publishing) author in response to changes in the publishing industry, and she took a short break from her fiction to pen an inspiring book about what she’s learned about going for it, called Never Too Late. I haven’t finished it yet, so I can’t tell you all of her pearls of wisdom. But check out this blog post she wrote on reinventing herself in the midst of what looked to all the world like an enviable, perfect career. She’s going for it. She makes me realize that the only way to free up that quality inside is to listen to voices who believe such things are not only possible, but a great way to live. This entry was posted in Book Recommendations, Inspired By, Perspective and tagged Chris Evert, claire cook, Never Too Late, Sloane Stephens, US Open on August 29, 2014 by Trish Ryan. The US Open is making my week, and Chris Evert’s commentary in general is among the better ones. And, I still miss Kim Clijsters. I was genuinely sad she retired just because she was awesome all around, as a tennis player and as a person. My favorite female tennis player, hands down.